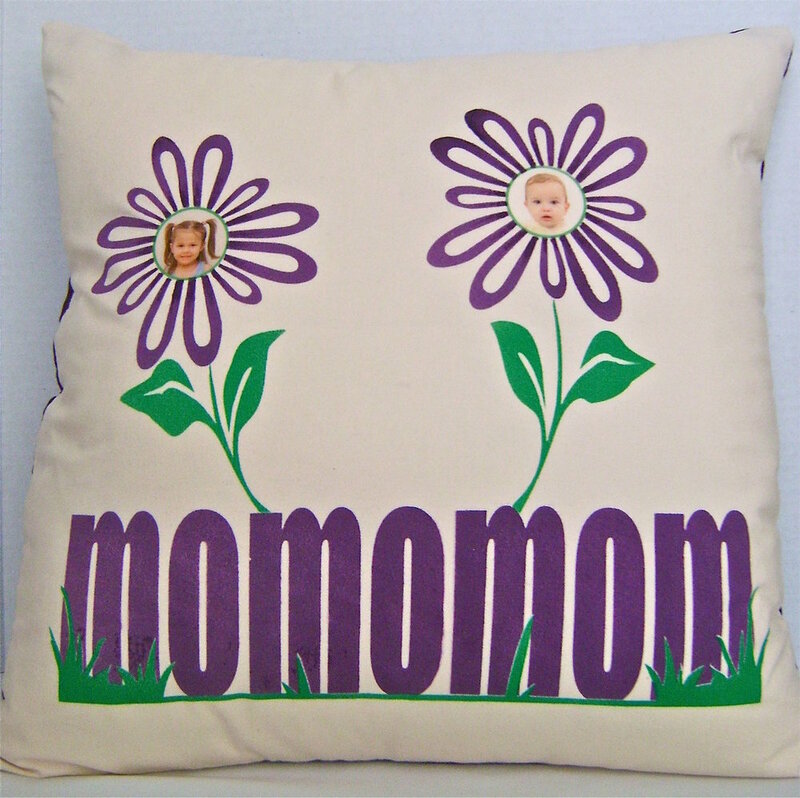 Help Mom relax this Mother’s Day by resting her head on a pretty, personalized pillow featuring the faces of her little ones in a garden setting. No fancy sewing ability is required. Six straight lines of stitching are all it takes. Print and cut the stencils included with my instructions onto card stock to paint the garden scene on the peach cotton pillow front. The back is solid purple corduroy. Got a big family? Reduce the size of the flower stencils and add as many faces as you like. The kids photos are easily printed from your inkjet printer onto a sheet of clear film and glued to the fabric. Mom, Mom, Mom! Is she going to love this! step 1 - Cut the peach fabric into a 17” square. Iron fusible interfacing on the wrong side. step 2 - Use a craft knife or stencil cutting machine to cut out the Mom stencil. Be sure to save the center of the “O”s. Spray the back side of the pieces and stencil with Spray Mount adhesive. step 3 - Center the stencil on the fabric and allow 3” between the bottom of the letters and the edge of the fabric. Be sure to position the centers of the “o”s on the fabric. step 4 - Cut out the left and right grass stencils and overlap them at the vertical line provided. Tape them together then cut through the overlapped area. Do the same with the die cut pieces. Cut these two stencils very carefully because you will be using the die cut pieces as well as the stencil. step 5 - Apply Spray Mount adhesive on the back of the die cut grass piece. Center, align, and press the piece onto the Mom stencil. The bottom edge of the grass piece should be flush against the bottom of the Mom lettering. step 6 - Protect areas outside the stencil from over spray and airbrush the open areas with purple paint. step 7 - Remove the stencils. step 8 - Apply Spray Mount adhesive on the back of the grass stencil. Matching the shape created by the die cut outline, align the stencil and press it to the fabric. step 9 - Position the leaves above the purple painted lettering. step 10 - Protect areas outside the stencil. Airbrush the open areas with green paint. Allow paint to dry thoroughly before removing stencils. step 11 - Apply Spray Mount to the back of the flower stencils and position them above the leaf stems. Airbrush with purple paint. step 12 - Allow the paint to dry and remove the stencils. step 13 - On your computer, bring the faces for your pillow into a photo manipulation program like Photoshop Elements. Reduce or enlarge the image to 1.25”. Create a green round border to contain the image and add more color to the finished pillow. Reverse the image and print it onto the shiny side of the film. step 14 - Step 14 - Use scissors to cut out the circle. Spray the printed surface lightly with Super 77 adhesive. Press the circle sticky side down into the center of the painted flower on the pillow fabric. Roll across the image with a round glass bottle to remove any air bubbles. The film is very soft and flexible making it ideal for fabric applications. step 15 - Use a pin to separate the backing from the film. step 16 - Create the back of the pillow. Cut two pieces of purple corduroy, one 10” X 17” and one 13” X 17”. With an iron, press a .50” hem on each 17” edge. Now turn and press the hem again to measure 1”. The raw edge will be tucked inside. Sew the hems in place. The two finished pieces will measure 8.5” X 17 and 11.5” X 17”. step 17 - Overlap the two pieces so that they measure 17” across. There should be approximately 3” of overlap. The 8.5” piece should be on top. Stitch on the existing hemline one inch in from the raw edge on both ends of the opening. step 18 - With the right sides together, sew the pillow back to the pillow front with a half-inch seam. Sew all four sides. step 19 - Remove excess fabric at the corners but trimming them at an angle. step 20 - Turn the pillow casing right side out through the opening and stuff with a 16” pillow form. Push the corners of the form into the corners of the casing. Pound on the pillow and shape it so the two back pieces of the pillow casing overlap each other. Place a pressing cloth over the painted areas and film if it’s necessary to iron the fabric.